In this jet paced era, there is little to no time for us all to be extra careful while using the sink and mounted mirror with sharp edges. 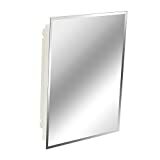 So this Large Simple Rectangular Streamlined Wall Mirror can be a good choice. It comes with an authentic silver-backed glass with safety polished edges for protection and a finished look. Thus, along with the stylish looks, it is safe to handle and use. The combination of sophisticated design and exceptional quality, won’t let you down. Now you don’t need to bother: “where to keep all toiletries?” KOHLER K-99003-NA Verdera offers adjustable tempered glass shelves for ample storage space. Best fitting to your bathroom size, you can choose widths ranging from 15 inches up to 40 inches. It has a Vertically Adjustable Magnifying Mirror. So now you can adjust it according to your height and convenience. It has Slow-close hinges prevent slamming of the door. Its Aluminum body gives you a rust-free long-lasting company. Mirrors in the inner side help avoid the hassle of the closing cabinet for the front mirror. It has 3 adjustable tempered-glass shelves and reversible opening with the left or right hand. “Simplicity is the best policy!” is that what you believe? Do you want to optimize that space behind the door fully? This product is designed in line with what is on your mind. It is the simple, immediate and affordable storage solution for your needs. The Deluxe model has a full-length exterior mirror. It is easy to install and can be mounted on the door hinges. You can take it on any door as it easily integrates with the door’s hinges, and can be opened or closed without any trouble. You can customize its interior shelves. It has the storage capacity of as many as 5 standard medicine cabinets. If you specifically want Archer shaped medicine cabinet to match your bathroom theme, your search ends here. This medicine cabinet not only allows hidden storage space but also adds style to your bathroom. Its anodized aluminum body has the durable rust-free and chip-free finish. The full-overlay mirrored door with beveled edges and mirrored interior ensure your convenience. Are you planning to give your bathroom that elegant furnish with beveled-edge designs that are in trend these days? You may like to begin with medicine cabinet. The Jensen Horizon 868P34WHG features the stylish looks and quality materials that go into the making of a good product. Add a sparkle to your bathroom’s surroundings and the smile of satisfaction on your face each time as you use this product. Its recess mount ensures a snug fit on your wall and blends with any theme for ages to come. It has three glass shelves that it can be customized according to your toiletries’ cases and bottles. So now, your bath essentials would be handy and no longer scattered over the vanities’ top creating a mess. The wide cabinet opening due to continuous piano hinge makes the access to them quick and easy. It has welded steel body painted with white acrylic preventing rust and adding durability. Mirror, mirror on the wall, what is the easiest way to clear the clutter of the toiletries in the bathroom and stop them fall? No. You don’t need to buy the magic mirror even if it is available to get that question answered. 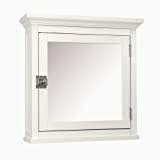 Purchasing a medicine cabinet with a mirror would be the better and tangible solution instead. With this medicine cabinet, you can keep almost all your basic bath essentials within reach and organized. It has 2 adjustable and 1 fixed polystyrene shelves. 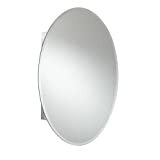 The quality mirror will give you clear reflection for years to come. The door can be mounted with the left or right-hand opening. The rounded internal corners ensure no dirt gets in the tight seams, thus making clean up quick and easy. The door has a magnetic catch with riveted striker plate so even the slightest push can close it properly. 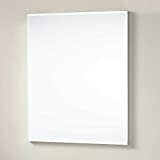 Be it traditional, contemporary, classic, or unassuming transitional, with this recessed mounting medicine cabinet you can express your preferred style-statement at your best. The Jensen Medicine Cabinet has 3 adjustable glass shelves. You can adjust it as you please. Shampoo, soap, loofa, brushes, etc. can get in it and stay tidy. Its rust-resistant painted steel body is easy to clean and maintain. The innovative rubberized magnet closure ensures the door does not bang and closes silently. The mirror on the backside of the door lets you get groomed while having immediate access to cosmetics and other items placed therein. Is contemporary medicine cabinet with crown molded top and vintage white finish, all you require for remodeling your bathroom this time? The Madison Medicine Cabinet will complement with your décor drive then. Its sturdy engineered-wood construction; classic, pure-white finish with an adjustable shelf is very functional. Tempered glass enhances the safety. The cabinet’s door has chrome finished knobs that facilitate easy opening as well as embellishment like a silver apple in the basket of platinum. Working in tandem with your self-reliant personality, the Croydex Aluminum Cabinets with Hang ‘n’ Lock Installation System certainly makes a smart addition to any home. You will need no expertise to install it, as the Hang ‘n’ Lock installation bracket makes it easy, simple, and a safe task. It can be installed by a single person in just four easy steps. Fix the brackets on the wall, adjust it using the built-in level, hang the cabinet, and lock securely in place. The two adjustable shelves allow storing a range of cosmetics or bath essentials for you. This aluminum cabinet with the double-sided mirrored door will help you get ready quickly for the go. If the brand name associated with the product is as important as its quality for you, then you have clicked the right product link in the category of mirrored medicine cabinets. Signature Hardware ensures high-quality products that showcase your unique style. It is made from premium quality aluminum and has 3 shelves allowing maximum storage. Its fully mirrored interior adds brightness to overall surroundings and décor of your bathroom. It has reversible hinges that allow the door to open from the right or left side. Material: When you think of buying a medicine cabinet the first thing you should check is the material. To help you get the best for your money, you should try to get a medicine cabinet that’s made from Aluminum. So this will ensure that the cabinet is sturdy and is resistant to wear and tear. Door: This is one of the most important parts of your medicine cabinet and doubtlessly you should give a careful consideration to the quality of door. The best of the medicine cabinets will have retracting and slow closing door. A mirrored door could be preferred for added benefits. Design: Undoubtedly the design of your medicine cabinet really decides how resourceful it is to you. Most of the high-quality medicine cabinets are rectangular in shape. On the other hand, you can decide the size of your cabinet based on your need and the things you’re contemplating to keep in it. A bathroom is yet another room. Whether it’s a vanity, a bathtub, or a sink; it is more than just plumbing, hardware, and decor. You may have gone through a lot of cabinets but what you really need is something that’s worth the money you spend. This gives lasting satisfaction and joy. So explore well before choosing your Bathroom accessories. Remember Mirrors are no exception, in fact, they are your reflection!